Comfortable, practical and high-tech flight suit by Supair. Durable, light weight and breathable. Easy to put on and take off, even with boots on. Designed to give a comfortable flying seating posture. New tighter cut for a better body fit. Inner and outer flap protected main central zipper. Removable elasticated ankle cuffs to keep the flight suit down over the footwear. Elasticated extended Lycra wrist-cuffs with hook and loop fastener adjustment, for a better fit and more wind protection. Elasticated retaining loops at the ankles hold the suit in place, preventing it from lifting up off the boot or shoes. Removable and replaceable. Large eslasticated fabric panel across the back, for added in-flight comfort. 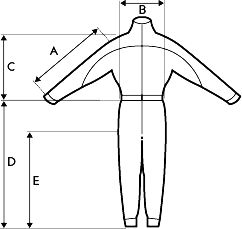 Double-tabbed zippers on both sides (running from ankle to armpit) and central front zip make it easy to get in and out of the flying suit, and also offer ventilation if desired. Central front zip with protective cover, running all from neck to crotch for useful access (especially for men). Reflective safety stripes front and back, useful for hitching back from a long XC when it's dark and cold! Large right and left chest pockets, for carrrying your radio on either side, or anything you wanted. Additional large left and right chest pockets, to stow away, maps, gloves, etc. Safety loops on chest for attaching a small microphone. Zipped, fleece-lined side hand pockets. Reinforced holding loop on the thigh, for mounting a vario. Cordura® Light Ripstop breathable damp-proof micro-porous enduction. Durable and lightweight. Damp-proof stretchable breath through fabric (membrane). *Exact colours and design may vary as the suit design, materials etc evolve with time.